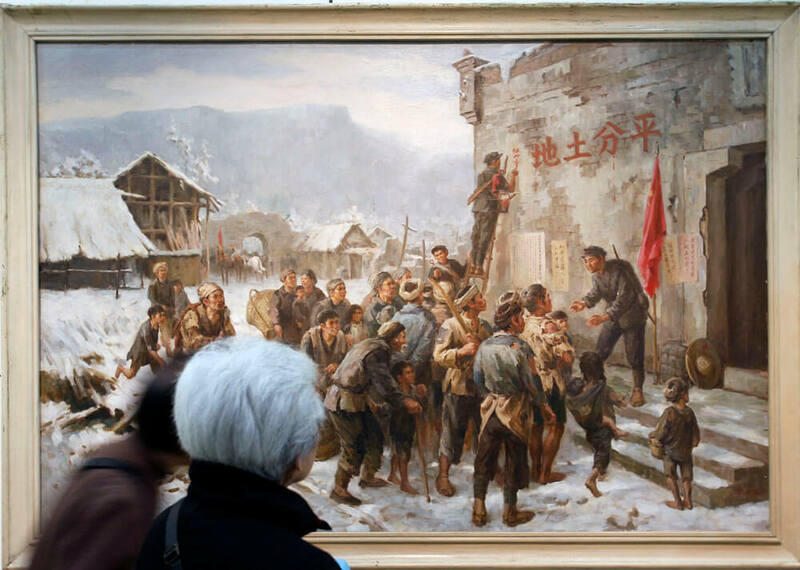 In Winter 1932 the Fourth Front Army of the Chinese Workers’ and Peasants’ Red Army, mostly composed of survivors of the Nanchang Uprising and armed peasants from the Hunan province, escaped Chiang Kai-Shek’s siege of the Hupeh/Honan/Anhwei revolutionary base and entered northern Sichuan across Mt. Bashan. 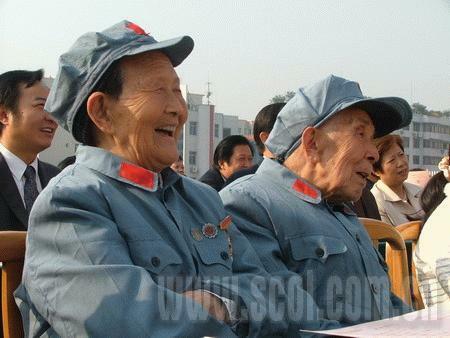 By early 1933, the Red Army controlled a 15,000 square kilometers area centered around the cities of Bazhong, Guangyuan and Nanchong, populated by over one million souls. Eighty years later, I was sipping tea in Nanchong while listening to my friend YI Chuanbi – his pet iguana perched on his shoulder – telling me of an old man he knew who had a perfectly preserved Szechuan-Shensi Soviet dollar and (for the right price) would be amenable to sell. 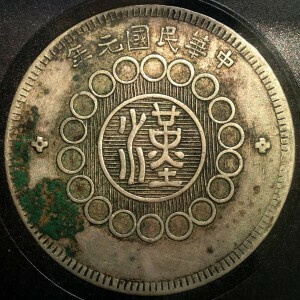 Chinese soviet dollars are the thing of legend: their rarity and historical significance caused them to be highly sought after by collectors very early on. 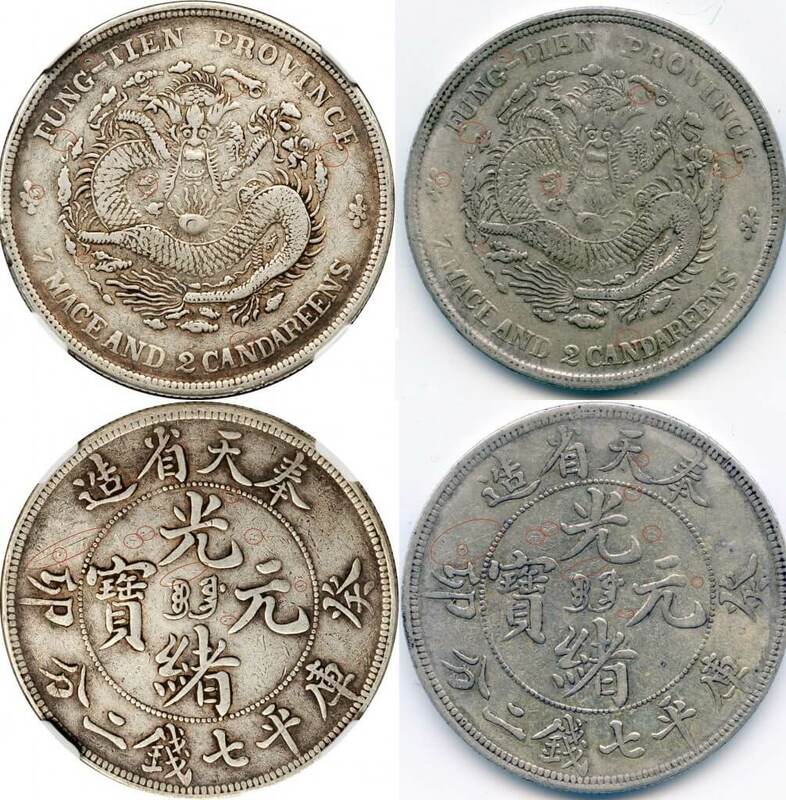 A Chinese Soviet dollar in uncirculated condition was already worth 1,000 yuan in the early 1980s, when YI was selling Szechuan dragon dollars 8 yuan apiece to buy games for his video game arcade business. Since then those prices have risen 20,000%, a performance comparable to AAPL shares during the same period! 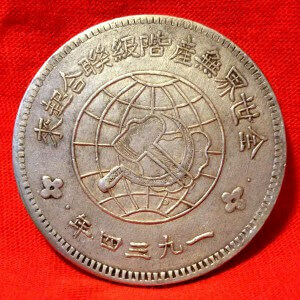 Soviet dollars are in a class apart from other Chinese coins: they are revolutionary relics, just like the stone-carved slogans that the Fourth Army left in the Szechuan province. 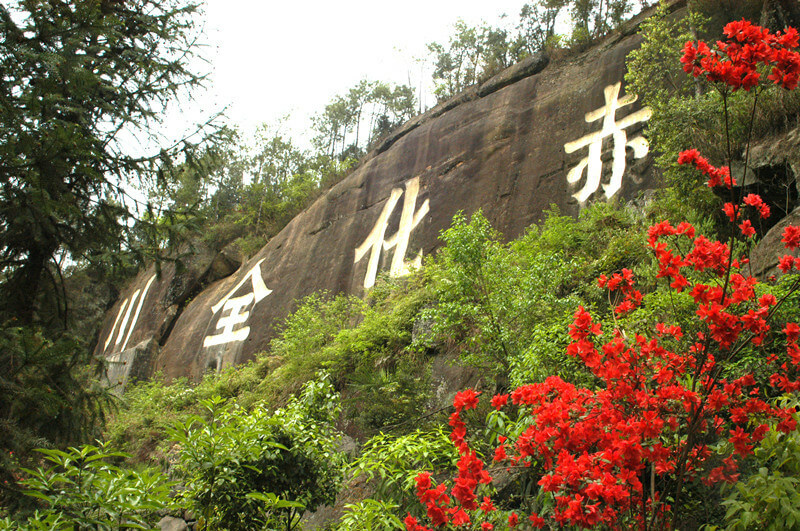 For many older Sichuan men and women, they are a direct connection to the heady days of their youth. 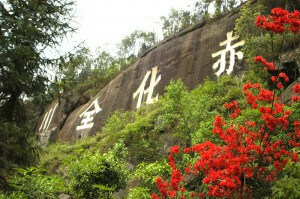 Red Army stone-carved slogan: Make all of Sichuan red! 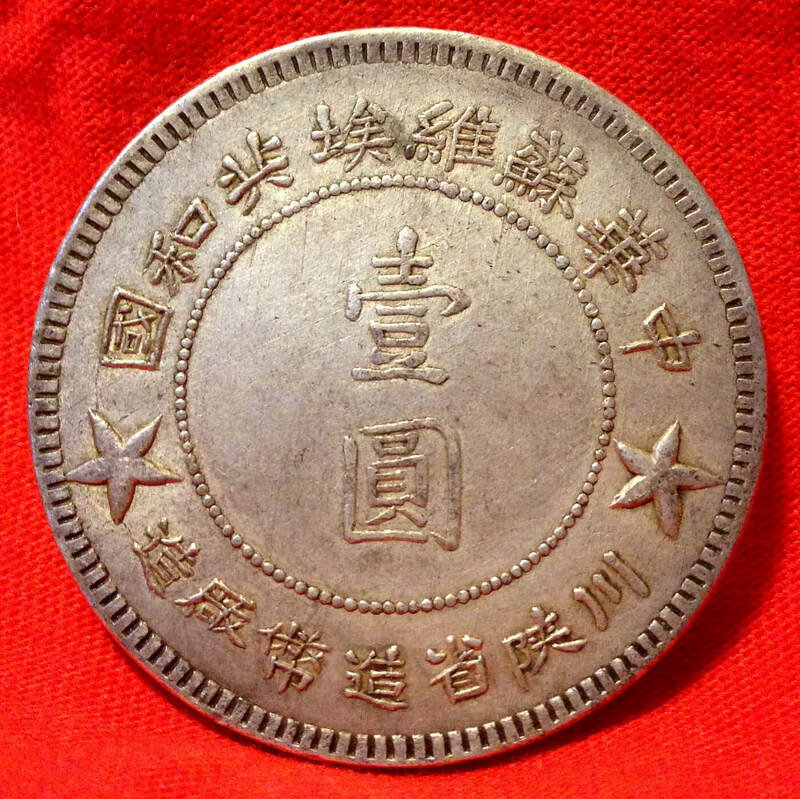 The Szechuan-Shensi Soviet dollar was struck in 1934 with hand-crafted dies at the Red Army Mint built in the Wangcang county (旺苍县) of Guangyuan (广元市), and were as much an instrument of propaganda as an instrument of payment. 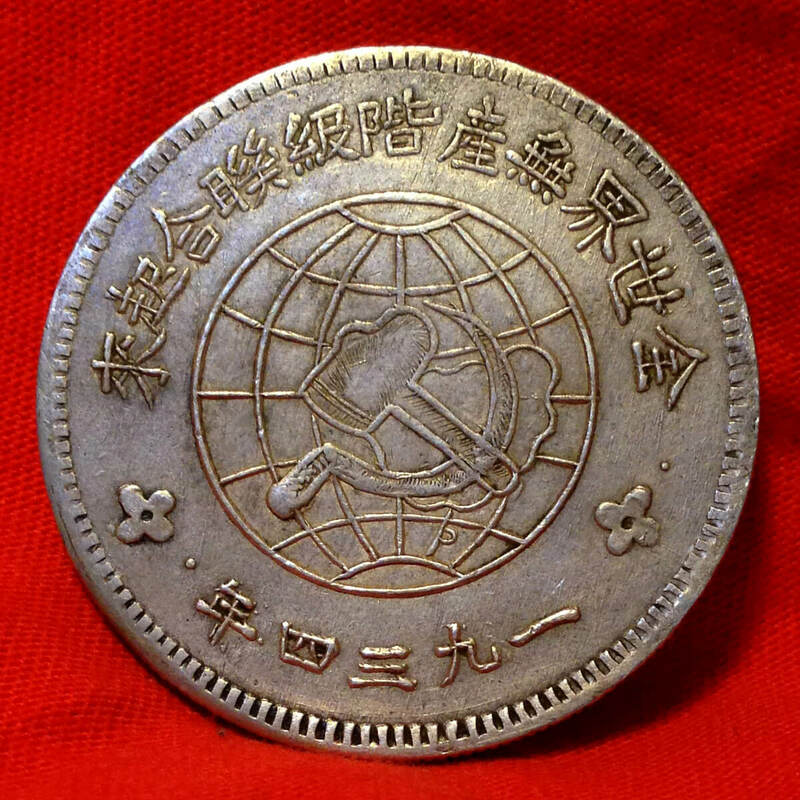 That politically charged currency, stamped with the symbol of the hammer and sickle spreading all over China and surrounded by the famous rallying cry “proletariats of the world, unite!“, was obviously banned and very dangerous to own in the territories controlled by the KMT or the Sichuan clique. For use in enemy territory, the Red Army Mint issued counterfeit Szechuan Military Government dollars instead. 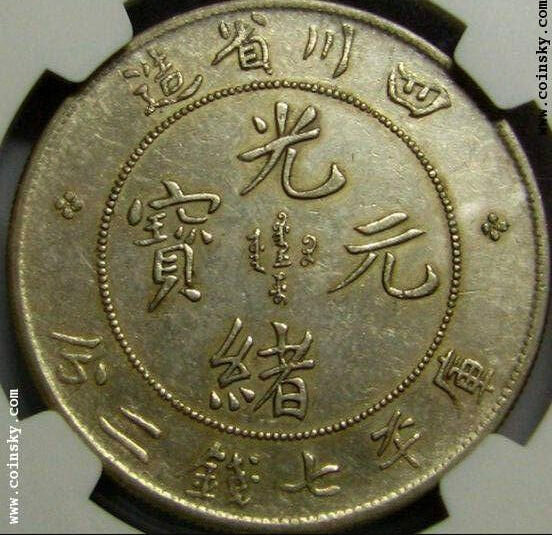 These fake coins, made with great care but with the same crude techniques used to produce the Soviet dollars, are easily identified by their hand-carved security edge and the concentric grooves on their surfaces. 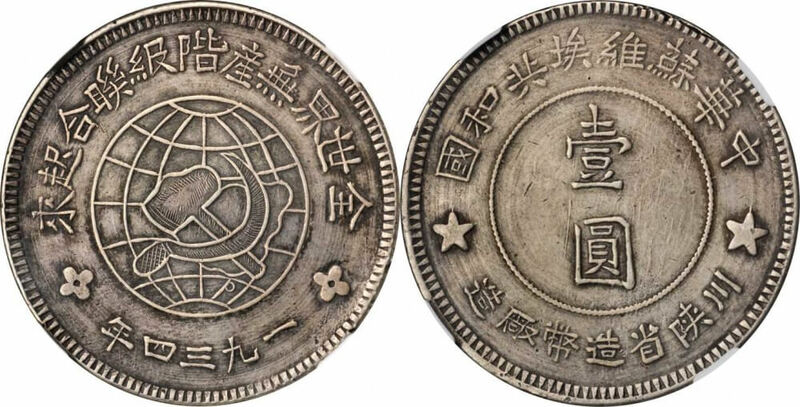 Most of these Red Szechuan Military dollars and Soviet coins were melted down into less dangerous shapes after the Fourth Army retreated in March 1935 to join the Long March and the nationalist forces regained control of the area. 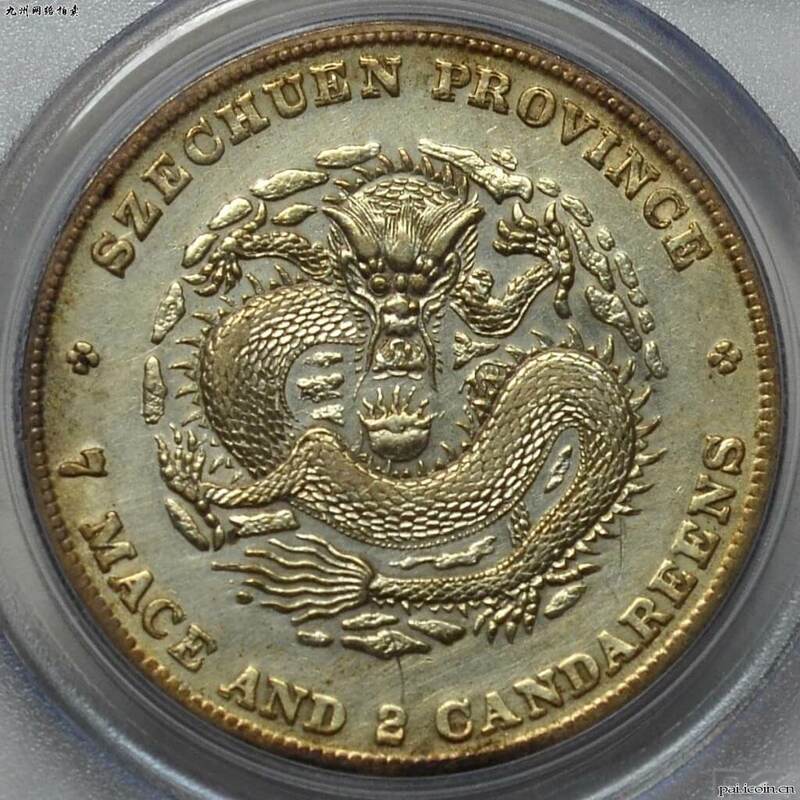 The few remaining coins were often kept hidden, either due to the risk they posed to their owners, or out of the old-fashioned concern that the fewer people know of your valuable possessions, the better! This combination of high desirability and elusiveness created ideal conditions for modern counterfeiters. Until smartphones with good camera became ubiquitous in China, very few collectors had access to anything better than low resolution pictures of genuine Soviet dollars, and even fewer had the opportunity to examine one “hands-on”. Even for collectors with deep pockets, it is therefore difficult to find a Soviet dollar both in excellent condition and with a respectable pedigree, made crucial by the large number of very high quality fake coins circulating on the market. You can now better imagine my excitation when YI Chuanbi first told me of this opportunity! In the end I did not succeed in buying that old man’s Soviet dollar in 2012, but after three years I finally managed to catch another one, pictured above. 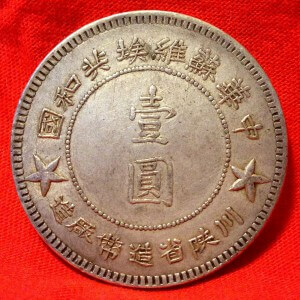 This Szechuan-Shensi Soviet dollar was circulated but is exceptionally well-preserved, with softly lustrous surfaces. 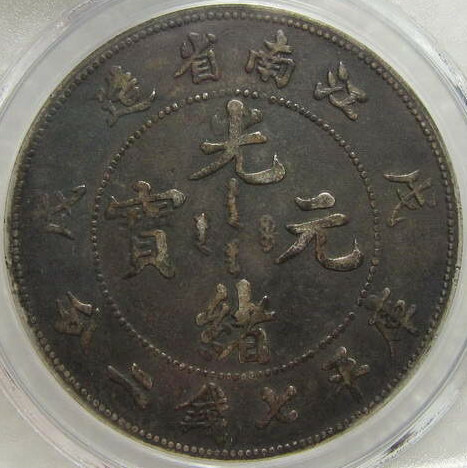 More importantly, it has an unimpeachable pedigree: it is the plate coin for the “Crab pincer” variety (CSSB-Y2-4-02) in 《川陕革命根据地货币图录》, one of the most detailed books on the money of communist China. It is a strange feeling to look at this heavy coin in the palm of my hand and think of the courageous men and women who carefully engraved dies and minted coins eighty years ago, doing their best despite the hardships and terrible conditions, with the hope of somehow contributing to change the world. Chinese Soviet dollars are truly a class apart. 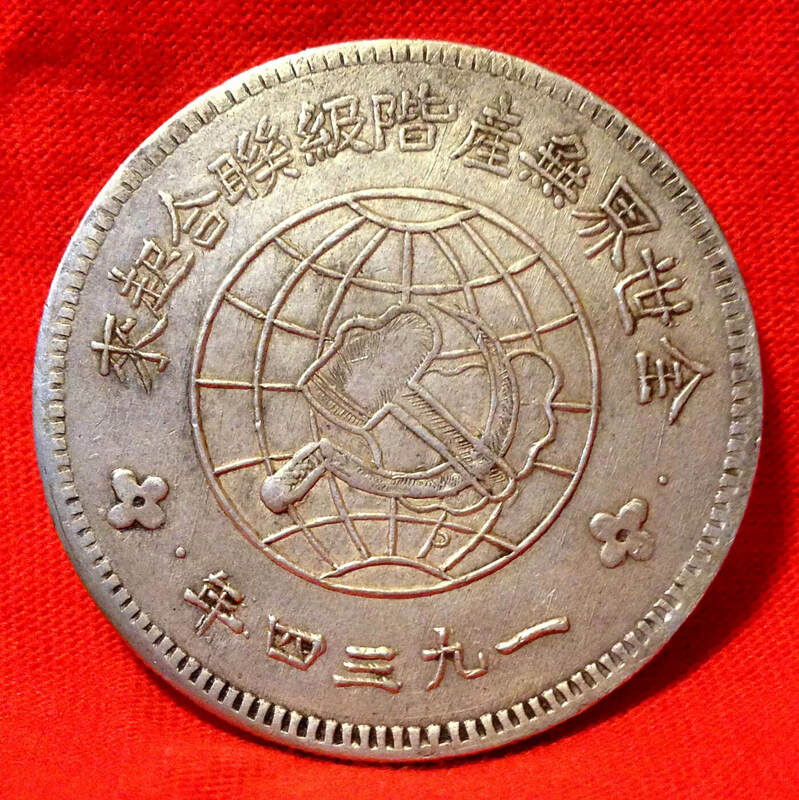 This is a common saying in the numismatic community – to the point of becoming a cliché – but it still bears repeating: buy the coin, not the holder. 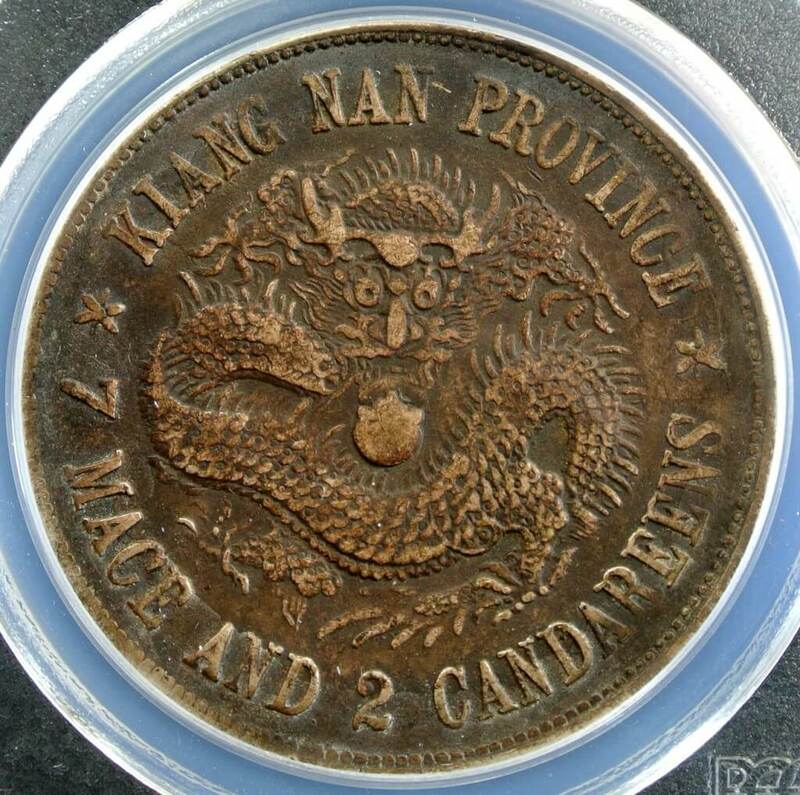 Today I will share with you the details of an unfortunate purchase, which hopefully should serve as a cautionary tale for fellow Chinese coins collectors. Collecting is a demanding hobby; to stay ahead of increasingly deceptive forgeries, ingenious alterations or tooling, one needs to keep on learning the most intimate details of Chinese coins. It may sometimes be tempting to simply rely on the knowledge of others and buy a coin that is “out of our league” with a relative peace of mind. I would urge my readers to resist this temptation, though. 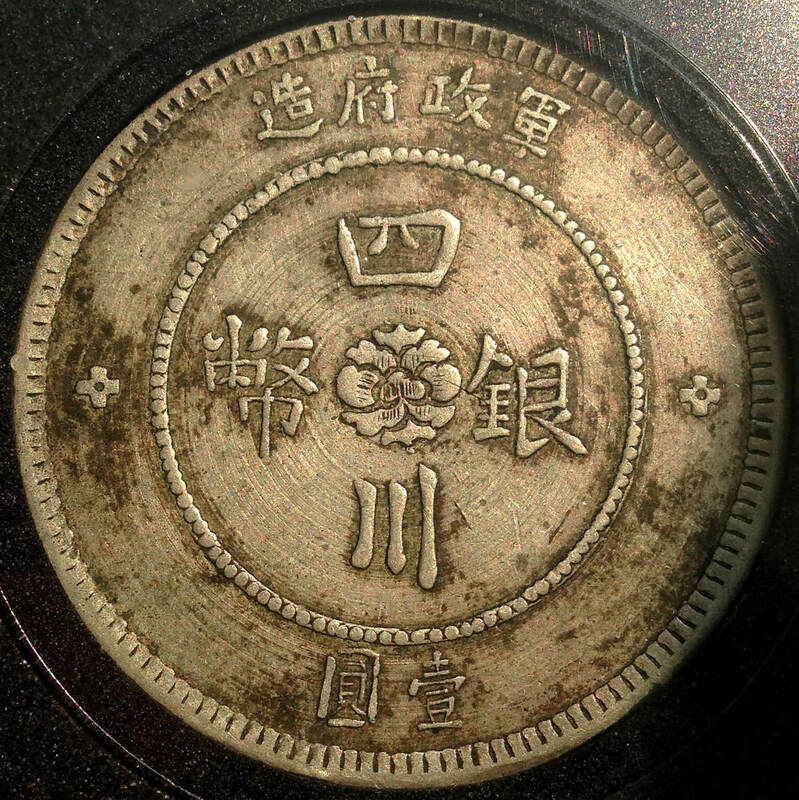 Certificates from grading companies and the opinion of more experienced collectors should only help confirm your own judgement. The coin I coveted is a particularly interesting variety of the famous Kiangnan Pearl Scales Dragon (also known as Dragon with Circlet-like Scales). 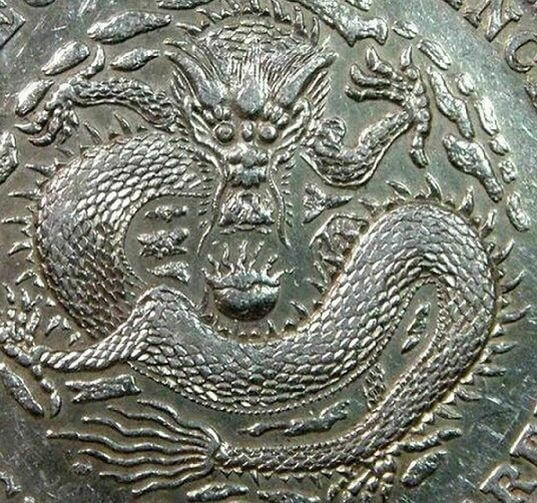 The dragon lost its tongue to weak strike, and has longer spines on its back and tail (江南戊戌珍珠龙长毛无舌版). 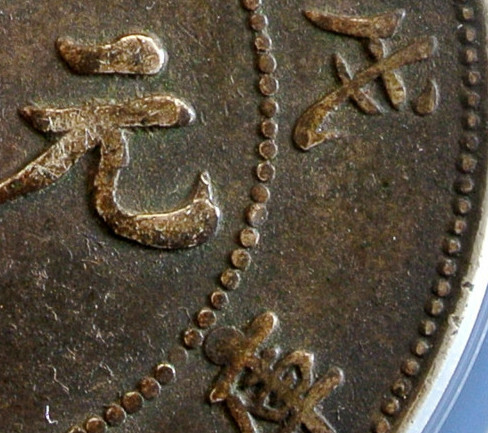 Additionally, this particular specimen has a very special characteristic, that I had never seen before: the top of the 庫 character, probably due to a die chip, was perfectly rounded (圆头庫). Carved right into the silver was the proof that the coin I bought was removed from its original GBCA holder, tooled with remarkable craftsmanship, artificially toned and successfully submitted to PCGS. 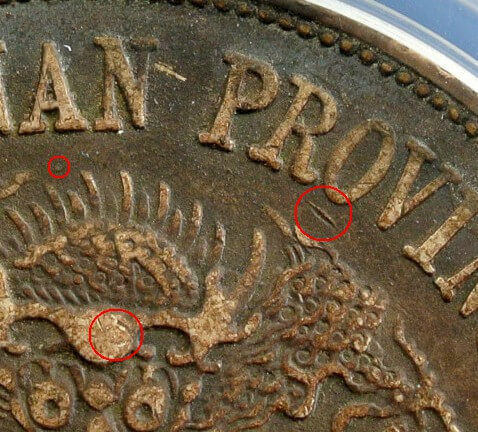 Altering coins is a cardinal sin in numismatics: it is always done with the intention to deceive collectors and artificially inflate the value of a coin. I personally consider this practice tantamount to counterfeiting. 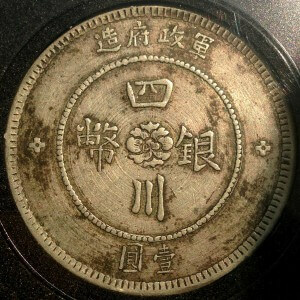 These two high level fake 1903 Fengtien dollars were spotted by reader Remetalk, using the same method I identified my altered coin. The coin on the left was listed at the April 2012 Hong Kong Auction, lot 21167, and graded NGC VF-20. The coin on the right was seen at the August 2012 Moscow Wolmar auction VIP №299, lot 1260. 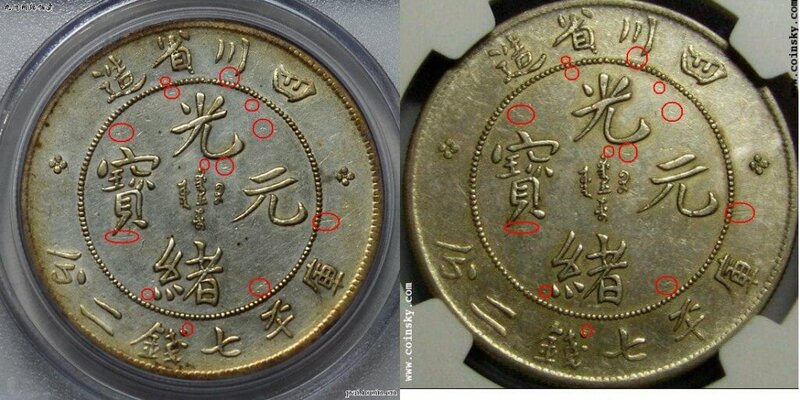 I spotted an identical fake in Beijing, graded VF details by PCGS. 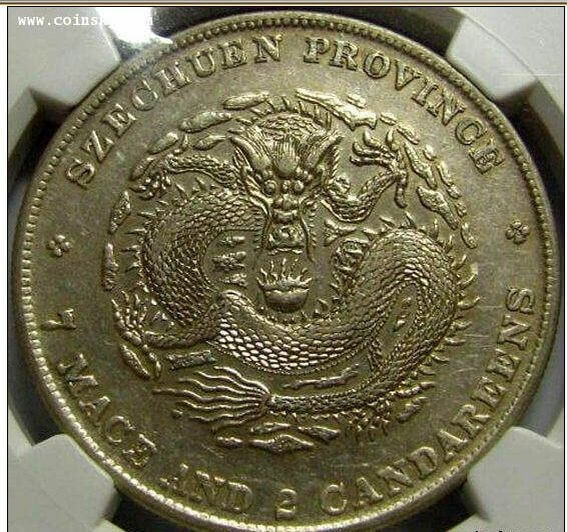 With Chinese counterfeiters getting increasingly skillful at deceiving collectors and even world-class grading companies, it is more than ever necessary for fellow Chinese coins collectors to keep their eyes peeled, avoid impulse buying and always verify the pedigree of rare coins. Buy the coin, not the holder.